Today I came across a freeware application for Windows 7, that turns your Windows 7 computer into a WiFi Access Point!!!! It emulates a WiFi router through Software!!!! And my problem is solved!!!! Now I can share my laptop's wired internet connection to my Android phone. Here is a 2-step guide to setting up everything. Download the application Connectify from here and install it. It will prompt you to install a driver, twice. Press Ok, for each prompt. 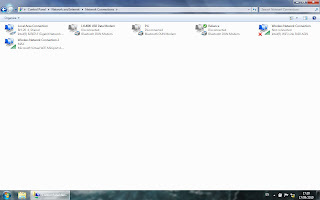 After the installation, you'll see an icon in the system tray which looks like . Click the icon. You'll see a pop up dialog as shown below. 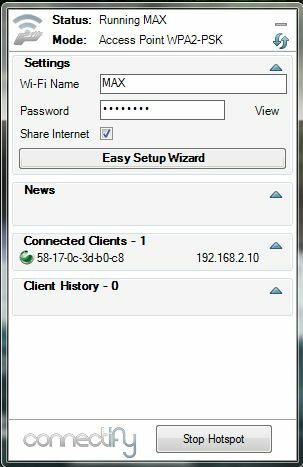 After the re-boot, I could see a Virtual WiFi MiniPort adaptor installed in Network Connections with the name Wireless Network Connection 2. Then I launched connectify, I didn't see any drop down list in the mode box(screenshot. below). I entered a 8-character WPA2 key and clicked the Start Hotspot button. It took a while(about 15-20 seconds) to configure and my WiFi hotspot was up and running! 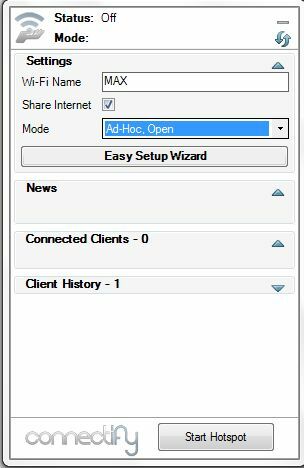 My Connectify popup was now with the Status: Running MAX, Mode: Access Point WPA2-PSK. I was a happy man! I turned on my phone's WiFi and connected my phone to MAX easily. 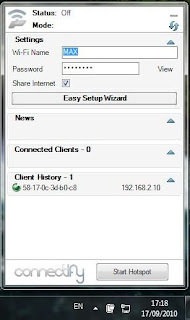 I saw my phone's MAC and IP addresses in the Connected Clients list. Even a Sony Ericsson logo was shown there!!! Everything was up and runing, still I couldn't browse the web. In he phone, I checked the gateway address and it was fine i.e. 192.168.2.1, that I had already cnfigured in WiFi static. I went to Network Connections, in my laptop. That can be reached through Network and Sharing Center > Change Adaptor Settings. I right clicked my wired ethernet icon and clicked properties. In the sharing tab Wireless Network Connection was listed as the Home Netowrking Connection. I understood that it must be set to Wireless Network Connection 2 which was the name of the connection that WiFi Miniport Adaptor had. I unchecked the box that said Allow other network users to connect through..... then clicked Ok, and closed the properties window. 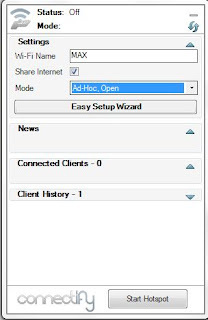 Then again right clicked my wired internet connection icon, clicked properties and in the Sharing tab checked the box Allow other.... 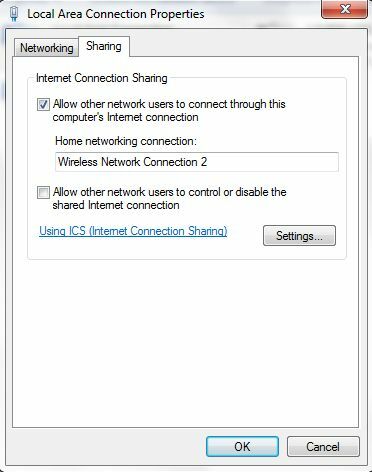 In the Home Networking dropdown I selected Wireless Networking Cnnection 2 and clicked Ok and closed the properties window. I restarted the hotspot and my phone got connected and I could successfully browse the web on my phone!!! One of the major issues with the phone that I had pointed in one of my previous posts i.e. 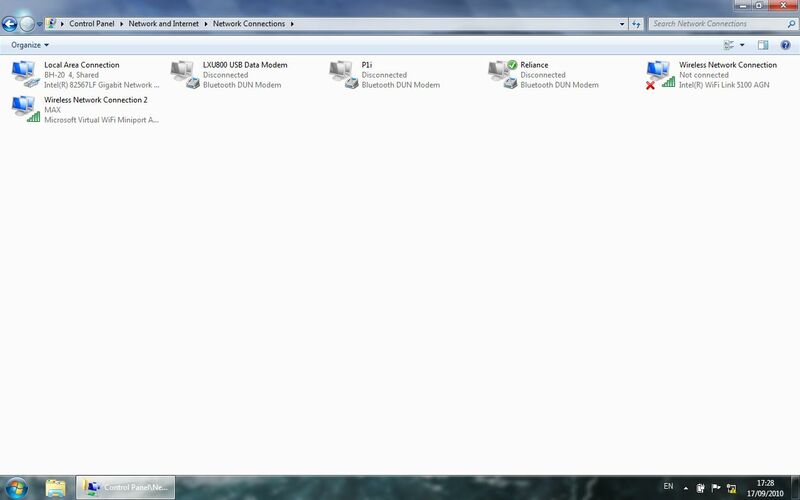 http://p97.blogspot.com/2010/08/sony-ericsson-xperia-x10-mini.html , has been solved!!! Go Android go!!! The adapter whose IP will be changed to 192.168.2.1 is different than the adapter you are using for internet access. I presume you are using LAN cable to connect to internet, not WiFi. If thats the case, then you don't need to worry. ....thanks ...it worked like charm! use virtual router, which is better and more supported IMO, (coz my phone doesnot connect to connectify, dunno y). for proxy u can root ur phone[req], then use proxydroid. 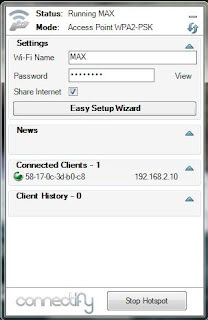 I tired to connect the internet in my sony xperia p using connectify.. but this mobile cann't find ad-hoc virtual wifi network during scanning... I tried all the steps you have blogged.. but i am stocked... Any suggestions? The Chirag Desert Camp Jaisalmer The Perfect Place to Escape Plan your trip to Jaisalmer with The Chirag Desert Camp is Luxury Desert Camp In Jaisalmer and get the best desert camping and sam sand dunes packages at an affordable price range.